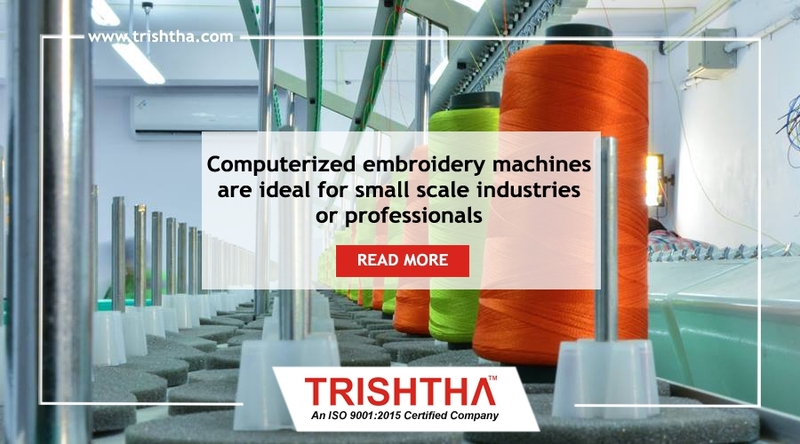 Computerized Embroidery Machines Are Ideal For Small Scale Industries Or Professionals - Trishtha Industries Pvt. Ltd.
Embroidery forms a noteworthy part of India fashion. India showcases a rich history in handicrafts and one of the most special handicrafts is embroidery. Different parts of the country have different types of embroidery styles like, Kashmiri embroidery in Kashmir, chikankari in Uttar Pradesh, Phulkari in Punjab, Kantha embroidery in West Bengal and so on. Previously, embroiders would design by their hands, but now there are different types of modern sewing machines available to ease their task. Trishtha, one of the leading embroidery machine suppliers in Kolkata, hopes to make embroidering easy for everyone through computerized machines. We manufacture and supply only the best in the industry and our machines are not only popular among small scale industry and professionals, but also home-based business owners. Design clothes on a large-scale purpose: Our computerized embroidery machines are great for designing a myriad variety of embroidery pattern on a large-scale within less time. The machines come with an LCD/LED screen where you can select from a number of pattern selection options. Our machine offer excellent efficiency and perfect for designers, professionals and small scale garment designing industries. Connected to the Internet: Since our machines are high-technology machines, they can be connected to the Internet, USB devices or design loaded cards. You can simply upload the design that you want to be embroidered and the machine does the rest of the work. Handles all types of fabrics: Our heavy-duty machines are able to handle all types of fabrics. You can download any type of pattern from the Internet and start designing. Minimum manual help: As one of the revered computerized embroidery machine manufacturers, we have made sure that the machines are able to function perfectly on their own without human intervention. Moreover, you do not need any particular skill or training to operate our machines. If you are starting your embroidery business or thinking of expanding, do consider our computerized embroidery machines. For any more information, get in touch without any hesitation.